Looks like we have an extra one staying here for a while, Jay-Jay will be stopping for around a week or two, while his room at his Dads is being sorted out. Our house in the last few months has gone from two plus Summer to now four of us, and of course Summer is not going anywhere. Jay-Jay's dad brought all his things round and there was a lot, plus some money for his stay here. He will be staying in the room he was in before. Trouble is, that is my sewing room plus handicraft storage, so I have had to move a lot of things again. With Andrew being here as well the house is filling up fast. Age UK quite busy but with an extra hand in the kitchen things went very well. A work experience lad has bean there all week. Doing a good job as well by what people were saying. I know he made my bit easier, Kieren was there as well so he did all the coffee machine drinks as well. Greg James has now got back in the saddle to complete his challenge. A joyful Greg as he has gone and done it--look how much has bean raised for mental health. Well done Greg. He said it was very cold at the top of Ben Nevis another weather front from Russia is on the way so I think he has just got it all done in time. Snow falling at times and drifting too, very cold. This is the second batch from Russia like we had before. I spoke to Wayne, he has had snow as well and bitter cold too he said. Took Jay-Jay in to town to get shoes and hair cut. Met Tommy-Lee (Jay-Jay's brother) on the way and after ringing his mum (Lindsay) he came with us and got his hair cut too. Jay-Jay got his shoes and he went off to meet his friends. Very cold in town, Tommy-Lee and I got caught in a snow storm and it was right in our faces we got covered. The sun kept coming out and the snow soon went. I think there will be more coming over night. A lot of snow has fallen over night as I thought, drifted in places, so deep in some and not in others. Summer loved her walk and was running around and going crazy. Icy cold wind but sunny as well at times. Pictures from mine and Summers walk. My boots as you can see not as much snow as last time. View along the river bank. Made some cakes again with chocolate in them like before, the little sponge cakes. I put mint sticks and Rollo's in them this time. Hopefully they will work out a bit better than the last ones. The last batch was good but the chocolate did not melt. Not much snow today just a little flutter now and again, still very cold wind. Cooked tea for all of us sausage, mashed tatties and roast, Yorkshires and carrots, Andrew had his veggie fingers plus the other bits. The sausages were very tasty. I do not eat a lot of meat and only usually have just one but today I had two and I was pleased I did as they were so good. Cakes I made not bad but still room for improvement. Still very cold, no more snow sunshine as well. Meeting at Jay-Jay's School today with Lindsay and Jay-Jay, a few positives and hopefully solutions. Since Jay-Jay is here living, we are responsible for him so that's why we were invited to the meeting. Hopefully things will improve for him and he will get back on track. His behaviour has not bean the best but, he has bean diagnosed with ADHD and OSD. This has bean going on for a while, but things move very slowly with Schools and Doctors . Another meeting this time for me at Nottingham to access to see if I can still get disability payments. This has all changed now and gone on to Personal Independence Payment (PIP). The lady seemed positive I would still get some payment but its not her decision. I know it helps a lot with the things I have to pay for like Pilate's, Acupuncture. I am hoping soon to start going in a spa pool. All at extra cost to me. The National Health do not pay for things like this. I have said once before in a Blog that in many other situations I could get more help but NO, not for this RSD. Makes me mad at times. I have stopped taking DIAZEPAM too many bad side affects. All the snow that had fallen has now gone. Is this the last to come now? Not at Pilate's today not feeling too good, got a sore raspy throat and full RSD pain. I tried to keep busy with rests in between. Going hot and cold all day sweating like crazy. Feeling very tired but not able to sleep. B12 today god did this hurt-- sent a nerve pain straight down my arm to my fingers. Carried on into town to get a few bits. The pain went after a while back to normal RSD pain. Still not feeling the best now a cough to put up with and tight chest. When I got back Angela was here for a chat and a drink. Clocks back last night so an hour less in bed. Did some of the garden, general tidy and cut back a lot of the dead bits. Sorted out the greenhouse ready for the tomato and plant seeds. A lovely Spring like day and quite warm as well. Finished off the garden looks very tidy now and bare. A frosty start to the day as well quite cold after yesterday. Only Britain can you get so much changeable weather, probably a few other places as well. I know Amsterdam is very much like here as well, but with more rain. Jay-Jay is moving back with his Dad now so came round for all his things. Seemed a lot less from when he came. Better packed in boxes I think. Waking today with Pup we saw three squirrels, a robin and a pheasant. A mile from town and we get all this more than some who live in the country. Pilate's today went okay but still hard for a lot of the moves. Jo did this new one where you lifted up one hip and stuck out the opposite leg. Not hard to do, but very effective. I asked her if this was HIP HOP, everyone laughed. Rained coming home and was very cold with head wind most of the way. Angela called round as her car was in the garage near by getting some work done. No Age UK-- closed today and Monday. Went with Angela to see Miriam a friend, her Birthday is tomorrow and she's eighty three years old. Took her a card and flowers. Angela took her cardigans. She was pleased to see us both. She has bean in a home since the beginning of December but hopes to go home again on the 9th of April. The home have bean very slow setting up some help for her. So she has to pay for the privilege of staying there, plus her rent on her cottage. As most know homes are not cheap. Got the washing dried outside but the wash line broke, I was able to mend it but its the size for a midget now. (its a whirley gig one) On to Angela's for a while, nice to see her cat again. A good afternoon just talking and drinking tea, she then brought me home. Got the ironing done before Wayne got here. Wayne's here for the weekend. At teatime we had a small Chinese, very tasty it was too. A good night just catching up with things and chatting. Looking after a neighbour's two cats for a few days. They are very cute, one tabby stripe and one fluffy black. Did some machine sewing for Angela. Lindsay called in and had dinner with us. So did Jay-Jay and a few mates. Ten of us today, I was cooking chip for ages. Anyway everyone fed and watered and full. Paul gave Lindsay and the children a lift home as he was going that way. Jay-Jay and his friends still here for a while then peace. Paul, Wayne and Andrew had Mexican for tea, I had some mozzarella sticks. They were very nice too. Watched a bit of television with Wayne and Andrew then bed around four thirty. Summer at last has given up her old ball she uses on the common. I tried a few weeks ago but she would not chase after her new ball. This has happened before, she does not like change. I wrapped her old ball or what was left of it around her new one for a few days. Then she excepted it and I was able to throw the old ball away. Even then she saw me putting it in the bin and I think she knew it had gone for good. Old ball or what left of it. Just realised this is my 200th blog, all started on 13th July 2004. Well that's another month gone by. A bit better one for me I think, not as much pain. Hope things are as good for you all. See you next month......Love Gill. As I sit here all I can see is snow. The whole of Britain has bean turned into a Winter Wonderland. Pictures on our walk we went down the side of the river, Sincil Bank as it is now, home to Lincoln City Football ground. 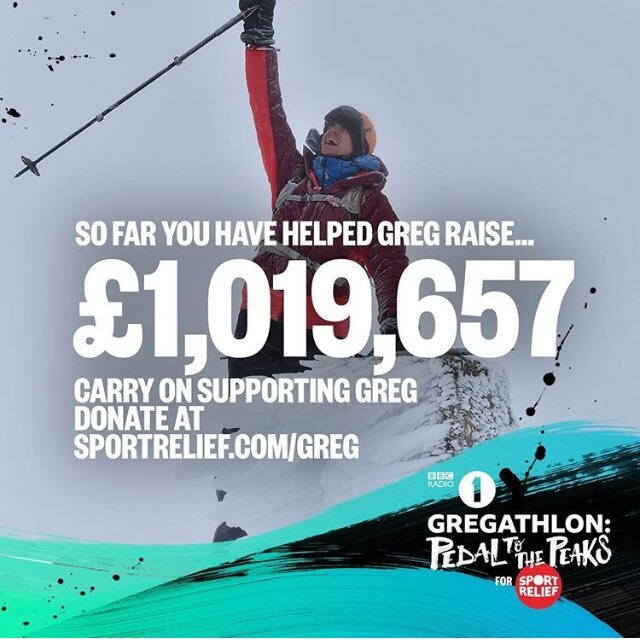 Poor Greg James from Radio 1-- is doing a Greg Athlon three mountains 500 miles biking. 5 days. 3 mountains. Lots of cycling. 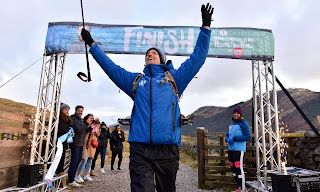 Greg James attempted to climb three of the highest mountains in the UK and cycle the epic distances between them for BBC Radio 1’s Gregathlon: Pedal to the Peaks. Foiled by the extreme weather on Day 4 of his challenge, he's planning to return to take on Ben Nevis and complete his challenge. 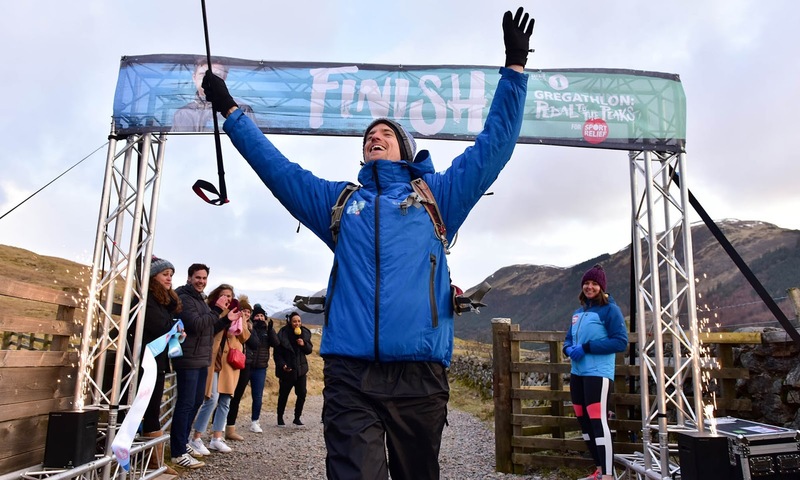 Radio 1 DJ Greg James has been forced to cancel his Sport Relief challenge because conditions were not safe to continue. "I've never felt more gutted about anything", he told Adele Roberts on Radio 1. Greg had already climbed to the top of Mount Snowdon and Scafell Pike - and had cycled in-between them - but he won't be climbing Ben Nevis on Friday. "We can't continue this challenge... at the moment. "That is it for today and that is it for the challenge for this week. "That means that we can't continue to Ben Nevis. "We literally can't leave here. We can't get there". Poor Greg he was in bits so wanted to finish but could not, the worst weather the country has had for years. This week was the the one picked, probably a year ago what bad luck for the team, but he will be back. Broadcasts were on 247 metres (1215 kHz) medium wave, using a network of transmitters which had carried the Light Programme. Most were of comparatively low power, at less than 50 kilowatts, leading to patchy coverage of the country. The first music to be heard on the station was "Theme One", specially composed for the launch by George Martin. It was followed by an extract from "Beefeaters" by Johnny Dankworth. The first complete record played on Radio 1 was "Flowers in the Rain" by The Move. The second single was "Massachusetts" by The Bee Gees. The breakfast show remains the most prized slot in the Radio 1 schedule, with every change of breakfast show presenter exciting considerable media interest. No Age UK today it has bean shut due to the snow. The paths are still thick with the snow and Summer loves it, we have bean on the common every day. Very tired today I think this is the effects of the DIAZEPAM I feel like my head is not conecting with my body. Very lighted headed as well. Bit of snow over night but this has not affected anything more. Made some cakes with a chocolates liqueurs in, the idea was that they melted and caused like a volcano inside the cake. This did not really happen but they were still good. Next time maybe chocolate buttons or something softer maybe a Rolo. Raining today so the snow is beginning to go. Jay-Jay and friends came round to see me in the afternoon. I like them coming round as its like when my children were all young and bringing their friends round. Some days quite a few of them. I came back from a fell run once and there were 12 or more pairs of shoes in the hall way. All gone by six I said and they were. Again more Happy Days. Jay-Jay's Birthday on Tuesday so I did this for him. He ate it while he was here and said it was good. More over night rain has caused most of the snow to disappear. Looking out dining room window. River looking both ways this has risen a lot. On the way to the common. Still a little bit of snow, but I think that will be gone by night time as the sun is out and its quite warm. Angela came round as we are hopefully going to see "Finding your feet", at the pictures tomorrow afternoon. Pictures was very good sad at times and funny as well. I did not enjoy it as much as I should have because of the pain and spasms. Sometimes I just have to grin and bear it. My friend Jenny from Age UK is quite ill and has a very bad chest infection. Hope you get better soon Jenny. Side affects of the DIAZEPAM are not good still a lot of muscle pain and tightest. I feel like I need help but where from? No Pilate's today just not up to it. Far away feeling and headache. I was told they might help me sleep. NO they have not. I think I have reached the state of exhaustion. On our walk Summer and I saw three squirrels playing and running around, so cute they looked just like little kittens playing. Age UK. I did go but it was a last minute decision. Worked with Ian who I have bean with before. We work well together. Not too busy so that was good. Ian did most of the Cappuccino and latte drinks so my wrists were not in pain. A fair day bit of shopping later then home. Today while walking this morning, we saw three Robins I think that is quite unusual. Lindsay came round and brought me Mothers Day presents and cards from her Ben, Jay-Jay, Tommy-Lee and Jamie-Lee. I looked after Jamie while Lindsay went into town with Tracy. Jamie and I played with the little dolls and Summer was joining in as well. A nice afternoon. Night time nerve pain shooting up from my spine going down my legs and shooting up my arms. The pain was very bad. This made me feel sick as well. I went to see my Mum and put two plants on the plot. Wish I was giving them to her in person. They say time heals, I don't think so. Things I would like to tell her and talk about. She was not just my Mum but a friend as well. Jay-jay came round in the afternoon with four friends and stayed for a while. Andrew was in the kitchen preparing the meal so I was not able to go in there. Andrew cooked an all fresh ingredients vegetarian meal for Paul and I and himself. 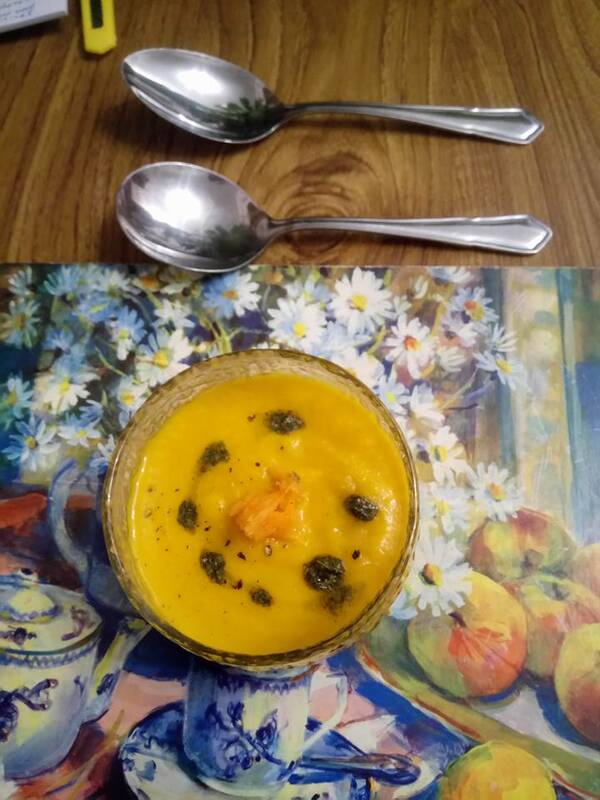 The starter was Carrot and Coriander Soup. 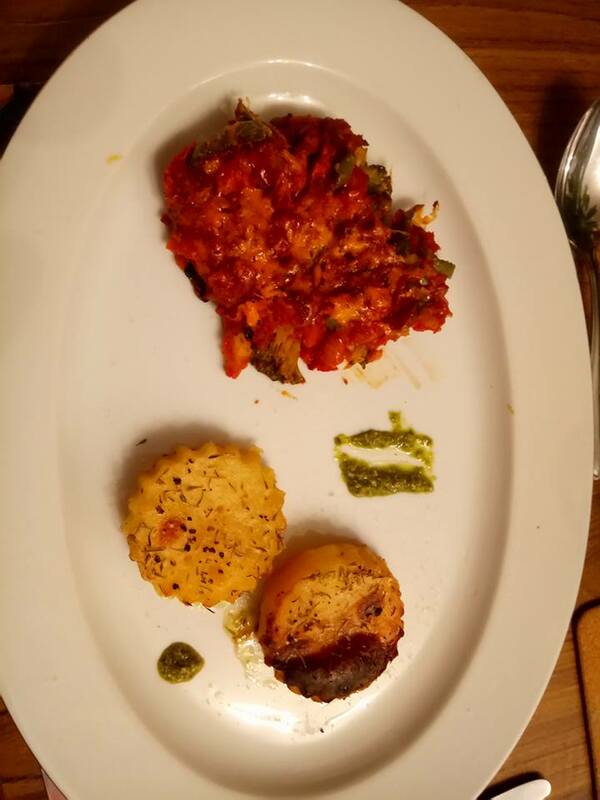 The main was Tomato and Broccoli Bake with Fondant Potatoes and Basil Pesto. 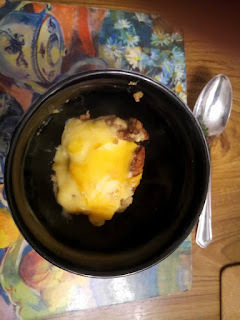 Dessert was Cinnamon Banana Bread Pudding with Vanilla Custard and it was really good. And Summer licked out the pudding dish. Absolutely beautiful many thanks Andrew from both of us and Summer. Summer at the vets today for the Booster and check up. The Vet was very pleased with her. He said She was one in a Million dog. I was very lucky to get one like her. She chose us when she was tiny Pup. Coming home on Andrews knee in the car. Camping in a Action man tent. On Andrews shoulder I think one of the best pictures we have of her as a Pup. ONE IN A MILLION THAT'S ME. This was because she has no skin or ear problems or any other things to do with the conditions that Westies get. Her weight was good as well she had actually lost a bit the vet said she had good muscle tone as well. The vet said she was a perfect dog and if she had pups they would be very much in demand. I knew she was a good girl and she's all mine. I forgot to take her injection card so will take it in while I am at Pilate's, as its very near by. Pilate's--very strong wind going. The session was not good for me as the pain was bad loads of spasms. I took 400 IBRUES be for and after the session to see if this would help I think it did a bit but not as much as it should have. Also after as well, this is about the same as any one with out chronic pain would take in one day. This was around two hours. Going home called in at the vets to get Summers book updated. Well not the best of months for me hopefully things will improve. All the best to you all love Gill.